HALL ON THE HILL. An as-yet-unnamed residence hall is under construction on UW-Eau Claire’s upper campus. 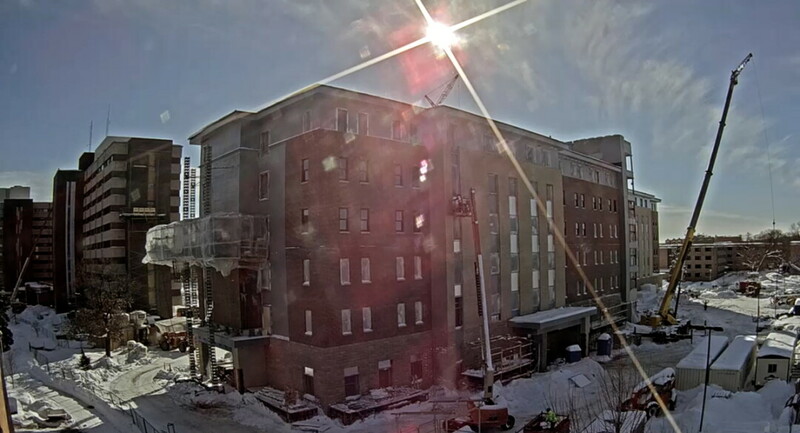 Construction on the hall – which will house 432 students when it opens in August – is viewable on a webcam. The 2018 construction season was the third-biggest in Eau Claire history, according to figures released by the city’s Community Development Department. The total value of construction permits issued by the city last year was $187.2 million. While that was a sharp decrease from 2017 – when a record-shattering $295.6 million in permits were issued – it was the third-highest total ever and was higher than the 15-year average of $148 million. “It can look as though we’ve taken a dip in valuations, but that’s just because we’re comparing ourselves to some record numbers,” said Scott Allen, the city’s community development director. The value of residential, industrial, and miscellaneous (including government) projects all increased in 2018, while commercial projects saw a steep dip, from $198 million in 2017 to $31.8 million last year. The decline in commercial valuation between 2017 and 2018 – as well as the decline in total valuation – had a lot to do with a pair of huge projects: the $78 million Marshfield Clinic hospital and the $22 million Mills Fleet Farm, both of which broke ground in 2017 and opened last year. While the $78 million Marshfield Clinic hospital topped the charts in 2017 and the $41 million Pablo Center at the Confluence was the biggest project of 2016, the costliest project last year was a $28 million residence hall at UW-Eau Claire. The unnamed dormitory is still under construction and is expected to open in August. Other big projects started last year include the $14.7 million renovation of another UWEC dorm, Karlgaard Towers North; a $6 million Xcel Energy project on Western Avenue; and the $5.5 million renovation of Eau Claire City Hall. The number and value of residential projects in the city increased, with their overall value rising 36 percent to just over $55 million. The total number of residential units rose (from 228 to 251) as did the total number of single-family homes (from 79 to 83). Furthermore, the average value of a new, single-family home was $254,000. While that was a slight decline from the previous two years, it was still markedly higher than the 15-year average value of $180,000. Nonetheless, in light of community conversations about affordable housing, Allen saw the the decline in average values of new homes as a step in the right direction: More modestly priced homes mean more affordable homes. The value of new industrial projects in Eau Claire also saw an uptick last year, according to city figures. The total value of new industrial construction was $35.9 million, compared with $30.3 million in 2017. The year’s major industrial projects included Xcel’s $6 million project and several large warehouse projects (worth $4.7 million and $4 million). As noted earlier, commercial construction saw a serious dip in 2018, falling to $31.8 million from $198 million in 2017. In addition, most of the year’s total value in commercial permits came from additions and repairs ($23.7 million) versus new buildings (just $8 million). Among the biggest commercial projects were a $2.9 million permit for the Marshfield Clinic hospital, $2.8 million at Mayo Clinic Health System, and $2.7 million at HSHS Sacred Heart Hospital. This catch-all category was actually bigger than the other three this year, largely because of several educational and city government projects. These included the two residence halls mentioned earlier, the renovation of City Hall, $3.9 million at Chippewa Valley Technical College, and $2.4 million at McKinley Charter School.